Cold weather gives me an excuse (as if I really needed one…) to spend long stretches of time by the warmth of a stove. On a recent vacation upstate, I took advantage of the region’s beautiful produce and charcuterie to make my lovely companions a special meal. Here, the lowly onion is given star status and roasted and stuffed to become a decadent main course. This meal takes time – and patience – but the result is sure to please and is perfect for fancy occasions. Serve alongside winter greens. To make this vegetarian, simply leave out the sausage. 2. Cut the ends of the onions and remove the papery outer layer. 3. Using a melon ball scooper (or another sharp spoon), cut the core out of the onion and remove all but the 2 or 3 most outer layers, leaving a 1/2 inch base at the bottom. Reserve the discarded onion. There is really no elegant or pretty way to do this and don’t worry too much if you cut through the bottom of the onion. 4. 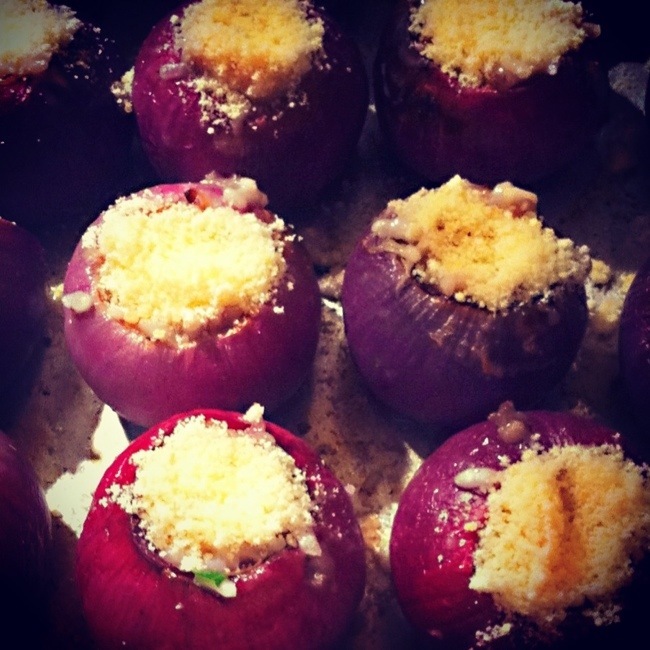 Place onion shells – top up – in a baking pan and sprinkle with olive oil and salt and pepper. Add 1/2 cup water and cover pan tightly with foil. Roast onions til tender but not falling apart, about 25 to 30 minutes, then remove from oven. Set oven temperature to broil. 5. While the onions are roasting, prepare your risotto: finely dice one cup of the reserved onion, then drizzle half the olive oil in a large pan over medium heat and stir in sausage. Break up the sausage (it should resemble ground meat when you’re done), then cook until lightly browned. Remove from pan and set aside. 6. In the same pan, heat butter and remaining olive oil, then add diced onions and garlic and saute til soft – about 5 – 7 minutes. Salt and pepper lightly, then add risotto and toast for a minute or two. 7. Add the warmed stock – 2 cups at a time – and stir frequently til all the liquid is absorbed. Repeat until risotto is tender (but not mushy! ), then remove from heat. Add the thyme and sage when the risotto gas been cooking for 15 minutes – this entire process will take 25ish minutes. 8. Stir the lemon juice, ricotta, half the Parmesan and chives into the risotto. Transfer onion shells to a work surface and pour off water in pan. Fill onions with risotto, then top with a tablespoon of Parmesan. 9. Broil onions uncovered, until tops are golden – about 5 minutes.